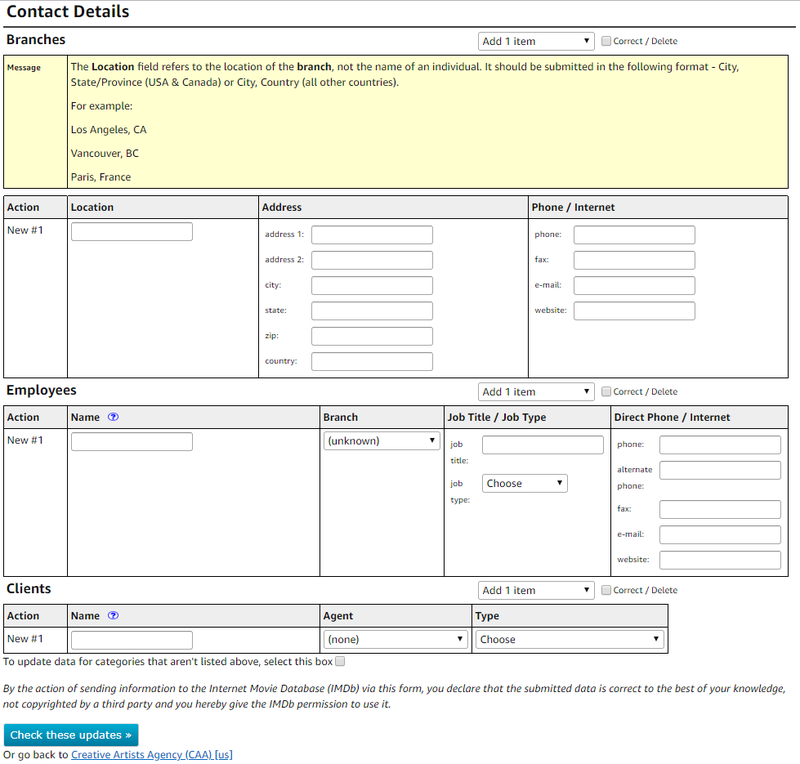 How is Contact Information structured? Who can edit Contact Information? How do I update my company client list? How long will it take for my submissions to appear online? Contact information is an email address, phone number or mailing address for a person or company you are trying to reach. On IMDb this is non-credit information such as the connections between companies and people, a person's employer, or an actor's representation. Representation includes a person's talent agency, PR firm, manager, etc. A company's Contact Information includes name and location, its client list, and its employee list. 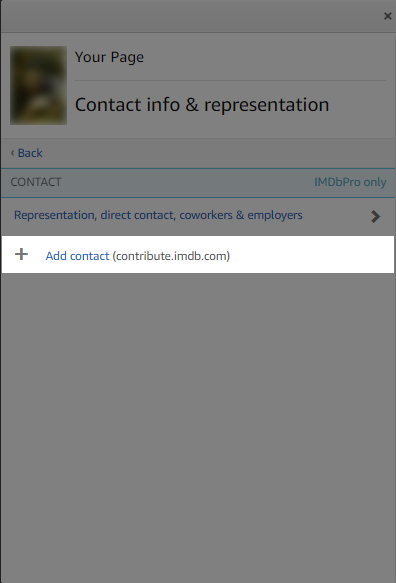 There are two types of contact information: IMDbPro unverified data and IMDb-Vetted contact information ("Contact Information"). IMDbPro unverified data can only be submitted for yourself via an IMDbPro membership claiming your page. This data is not vetted by IMDb editors and appears on the site with an orange asterisk ( * ) indicating as much. Note that IMDbPro unverified data is not hyperlinked. 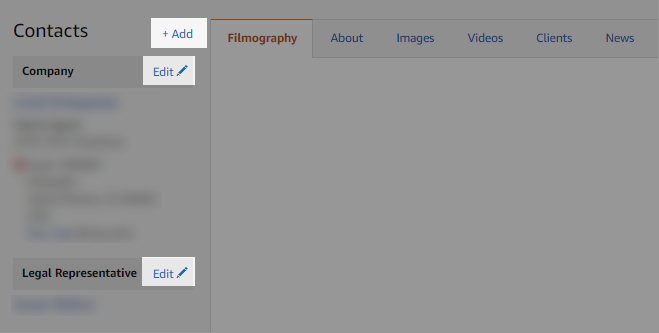 For example, if you add a talent agent to your IMDbPro page, it will display the agent's name as "flat text" in black rather than linking to the agent's IMDbPro page. Vetted contact information can be submitted to a person's IMDbPro page by anyone with a membership. For example, a manager can submit contact information for any of their clients. The information is vetted by IMDb editors and becomes part of IMDb's Contact Database. With IMDb-vetted contact information, the primary relationship is between the talent and the company that represents them. The specific representative ("rep") with the company is additional information. 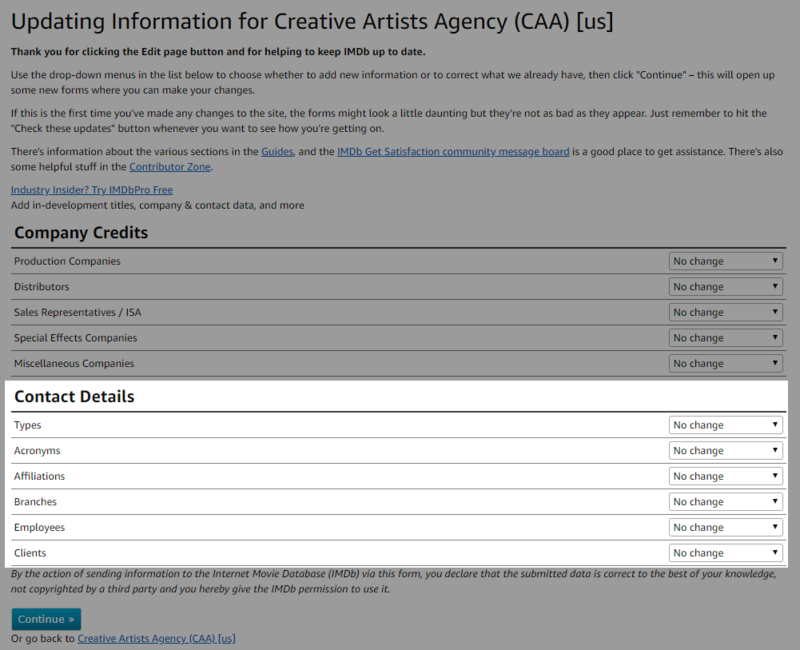 For example, in the above image, Creative Arts Agency (CAA) is the 'Primary relationship' and the 3 Representatives listed separately below are the 'Secondary relationship'. This means that when you add a rep, you should first add their company and then choose the specific rep afterwards if available. Structuring the data in this way allows us to display as many industry connections as possible and helps make a name page easier to find. What if the rep does not have a company? You can create a relationship directly between the talent and the rep. This is called a "Direct Client". What if the company represents another company? If a company represents another company, you can create an "Affiliation" between the two. Anyone with an IMDbPro membership can see and submit updates for Vetted Contact Information. These updates will be vetted by our editors and published to the site if everything appears to be valid. If you do not have an IMDbPro membership, you can join IMDbPro with a free trial here. How do I edit Contact data? There are a few different ways to access the update form on IMDbPro, these vary depending on if you're submitting updates to your claimed page or another name page which is not claimed by you - click the links below to be taken to these instructions. Via the Edit page button. If you are logged into your IMDbPro account, you can simply click this link to be taken to your Contacts page - from here click +Add contact to submit updates. See here for continued instructions. Whilst on your claimed IMDbPro name page, scroll to the very bottom and click - on the next screen click Contact information & representation followed by Add contact. See here for more instructions on how to continue from this point. On the 'Contacts' pane of your name page (to the left of your Filmography) you will see in-line links to submit updates - click any of these to move onto the contact update form. Start from that person's page on IMDbPro. Scroll to the very bottom, click to be taken to the contribution form. See the below for instructions on how to continue. I'm at the submission form, how do I submit updates? Once you've made your way to the contribution page, you will be presented with a form allowing you to submit changes to Contact Information. When adding representation, the most complete way to do so is to add both a rep's company as well as the specific representative who works there. Doing so has advantages: It will connect the talent to both the company as well as the specific rep; it is more accurate and it takes advantage of IMDbPro's deep interconnectedness. This allows us to provide a more complete picture of how talent and representatives relate to each other and will allow other users to connect through to client and representatives pages much easier. 2. Next, scroll to the bottom and click Continue to move forwards. On the next page: input the representative Type (Talent agent, publicist, manager, etc) you would like to have listed on your page. You should then enter the company name, including the country code in square brackets next to it (like this: Company Name [us]) - the system will provide a list of suggested companies based on your input, if the one you're looking for is listed here you can select it from the list, if not - click "Results not shown >>" at the bottom. Then click Check these updates. 3a. If the software does not recognize the company name exactly, it will again present a variety of choices. If the company is now there, select it from the list, otherwise, select the "Add this as a new company." followed by Re-check these updates. 3b. 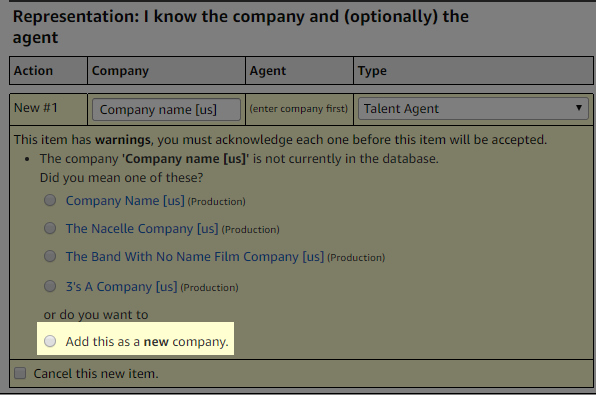 If you have chosen the company from the list or if the IMDb software recognizes your manually inputted company name, the next box will be highlighted in green and will give you the option of which rep you would like to add. If the rep isn't available in the list, it means they have not added themselves to the company as an employee - they should submit this information and once updated, you can retry this process. 4. Once the company and rep have been accepted, click Submit these updates at the bottom of the page and you will see a contribution confirmation page, this will include a submission reference. You will receive an email with the same confirmation for your records (it will also be available in your submission history here). If you do not see or receive the receipt number, your update was not submitted and you will have to submit the update again. For details about our processing times, please see our data processing time frame page and our When will my update be added? page. Use the instructions above on how to open the Contact update form and once there, see the following instructions. Once you have opened the submission form, you will be given options to correct contact information, including reps, employer or direct contact (i.e. your personal email or cell phone). Information submitted this way becomes part of the central IMDbPro contact database, making it visible on name pages, and on representation or employers' company pages. 2. Click Continue and you will be taken to a form with the content you'd like to update. Choose your appropriate action (Correct or Delete) and click Check these updates. 3. You will now be prompted to enter an explanation for why you want to remove or update the representation, please be detailed in here to help our editors in reviewing the submission. Then press Re-check these updates. 4. Once the information looks as you'd like and you have included an explanation to confirm why you're making the change, the box should turn green and will be ready to go. Click Submit these updates and you will see a confirmation page. You will also receive an email with the same confirmation for your records (and it will be available in your submission history here). If you do not see or receive the receipt number, your update was not submitted and you will have to submit the update again. IMDb does not show representation for deceased individuals. Rather, our policy is to create a new company for that person's estate (in the form of "Estate of John Doe") and allow it to have representation. For example, you may choose to list the Legal Representative or Publicist of an estate. To create a new company, see the section Add a new company below. What if I try to update information and there is nothing to edit. If you try to update information and the Edit Page form appears blank, one of two scenarios is likely in play. Scenario 1 - The information you are hoping to edit is contained in someone's IMDbPro unverified data. Note that IMDbPro unverified data is marked with an orange asterisk (*) and can only be edited by the owner of the page. See IMDbPro unverified data information above for details. Scenario 2 - You may be trying to update a client via the representative's page. Since the primary relationship is between the client and company (see how Contact Information structured), you will not see the client on the rep's page when editing. Please start at either the company's IMDbPro page or the client's IMDbPro page and follow the instructions above. You should now be able to edit the information you seek. To add or edit contact information relating to companies such as employees, location and more, start by going to the company's page on IMDbPro. Click on the "Edit page" button located at the bottom of the page - you will be given options to submit changes to Branches, Employees, Clients, Affiliations, Acronyms and Types ("types" being the company type: Talent Agency, Management company, Production company, etc...). Complete the form with as much information as possible and click the Check these updates button. Any ambiguous details will be highlighted in yellow or red, giving you an opportunity to clear the confusion. Once the information you're submitting is correct, click Submit these updates and you will see a confirmation page. You will also receive an email with the same confirmation for your records (and it will be available in your submission history here). If you do not see or receive the receipt number, your update was not submitted and you will have to submit the update again. For details about our processing times, please see our data processing timeframe page and our When will my update be added? page. 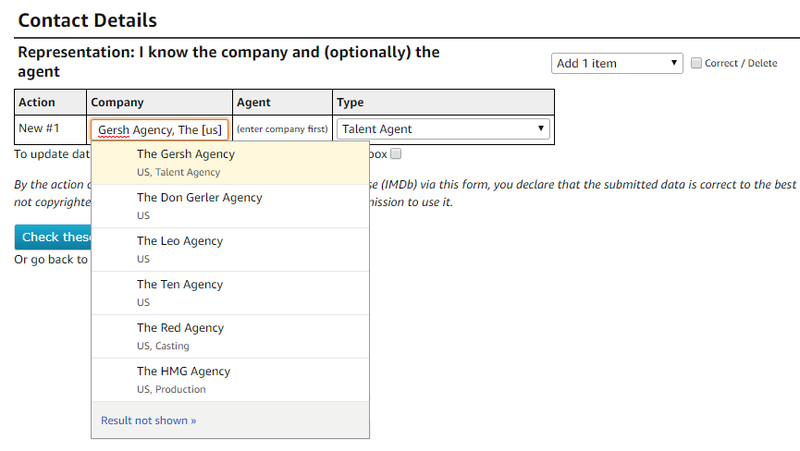 To add a single client, you should start from the talent's name page and follow the instructions above. However, to add a number of clients, we recommend starting at the representation company's IMDbPro page and submitting the clients in batches of up to 30 at a time. + Add Client - to submit new clients to the company. Edit - to update existing clients attached to the company. 1. On the update page, use the drop-down to choose the number of clients you'd like to add to the company in the one submission then click Continue. 2. 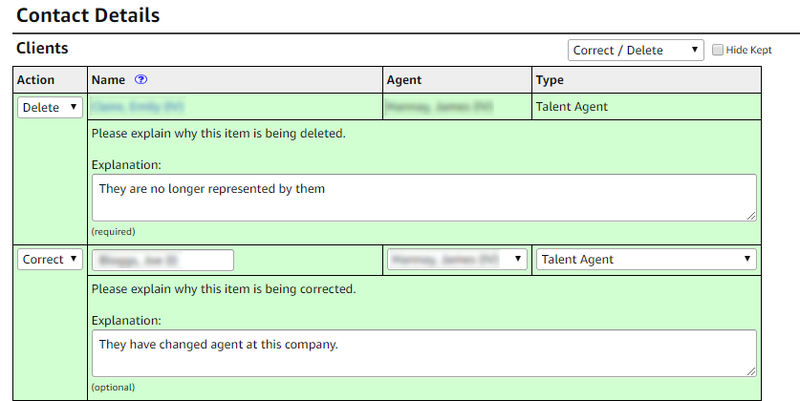 On the next screen, input the names of the clients you'd wish to add - along with the type of representation they will have and finally the agent who will represent them (if the agent is not listed with the company yet, this drop-down also offers the opportunity to add a new agent). 3. Click Check these updates, if there are any problems the box will turn red and you will have to address these individually, you may simply be required to tick an acknowledgement box. 4. Once you think everything has been resolved, click Re-check these updates and if everything comes back as green, it's ready to Submit. You will see a contribution confirmation page, this will include a submission reference. You will receive an email with the same confirmation for your records (it will also be available in your submission history here). If you do not see or receive the receipt number, your update was not submitted and you will have to submit the update again. 1. Select the drop-down field next to the Client section and choose "Correct/Delete" followed by Continue - this will take you to a page full of clients associated with the company. 2. Use the field next to each name to either Correct, Delete or Keep the client. Run through the list and select the ones you'd like to update followed by Continue. 3. On the next page, make sure to include an explanation to the changes where possible, or tick the option "provide an explanation to assist in processing this change" then click Re-check these updates to provide you with the explanation fields. 4. Once everything has been updated and had a green background, click Submit to complete the update. How do I add a new company to your database? You can add your company to IMDbPro either by linking the company to a title you're company is credited on or add your company as the employer of an individual currently listed on the site. To add your company to the credits of a title, please navigate to the IMDbPro title page and select "Edit Page" located at the bottom of the page. To add your company as the employer of an individual listed on IMDb, please navigate to their IMDbPro page and select "Edit Page" located at the bottom of the page. If you haven't already, we recommend claiming your page. This will allow you to claim your page or create a new one, if you don't have an existing page. To attach a new company to an existing piece of data (such as a title, or a person), you'll need to start on that title's or person's page. For example your company is a new Talent Agency and you have a number of clients to add. Start by going to the IMDbPro Page and clicking on the "Edit Page" button to display a link to "+Add" a name, scroll to the Contact Details section on the following page, choose to Add 1 item next to Employers and click Continue. On the next page, you should enter the company name and include the country code in square brackets like this: [ and ] as well as your title, job type and any other info you'd like to include. Click Check these updates. Since your company name does not yet exist in IMDb, you will get a yellow warning screen indicating there is some ambiguity. Click the "Add this as a new company" option and click Re-check these updates. Finally, everything should be highlighted in green, allowing you to click Submit these updates and you will see a confirmation page. You will also receive an email with the same confirmation for your records (and it will be available in your submission history here). If you do not see or receive the receipt number, your update was not submitted and you will have to submit the update again. If you cannot find a piece of information to which you can attach your company name please see the section above Add a new company. What companies are eligible to be listed on IMDb? Information added to our contact database using the Edit links have the highest priority, which means it will be processed on the first business day after submission. Due to system latencies, however, the data can take 48-72 hours to appear on the site. Information added via IMDbPro is updated to the site immediately (usually within a minute or two). If you are a talent representative and an IMDbPro member, see how you could benefit from using IMDb Client Scorecard.